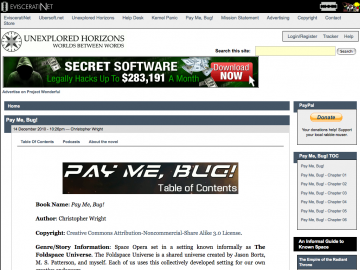 Muse's Success » Web Fiction Listings » Pay Me, Bug! "Oscar Wilde wrote a 'great heist' caper set in the far future... then I ripped him off." I make the claim that this novel is what Oscar Wilde would have written had he been reanimated and forced to write a space opera/big heist novel. It’s a cheeky and wholly baseless claim, and I have no doubt I will be forced to recant it someday. New chapters are posted Wednesday, a podcast of the chapter (read by author) is posted the following Thursday. Pay Me, Bug! has not been reviewed yet. Pay Me, Bug! has not been recommended yet.